The 2016 IEEE Power and Energy Society (PES) General Meeting was held in Sheraton Boston Hotel, Boston, MA. Dr. Parvania presented the newly published Transactions paper titled “Unit Commitment with Continuous-time Generation and Ramping Trajectory Models”. 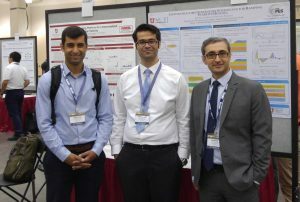 PhD Student Mr. Roohallah Khatami presented a poster on “Continuous-time Generation Scheduling for Ramping Scarcity Healing” during the PESGM 2016.